This recipe for Czech vanilla crescents or vanilkove rohlicky is popular year-round, but especially at Christmas time when they become part of vánoční cukrový (vah-NAWTCH-nee tsoo-KRAW-vee) or Christmas sweets. 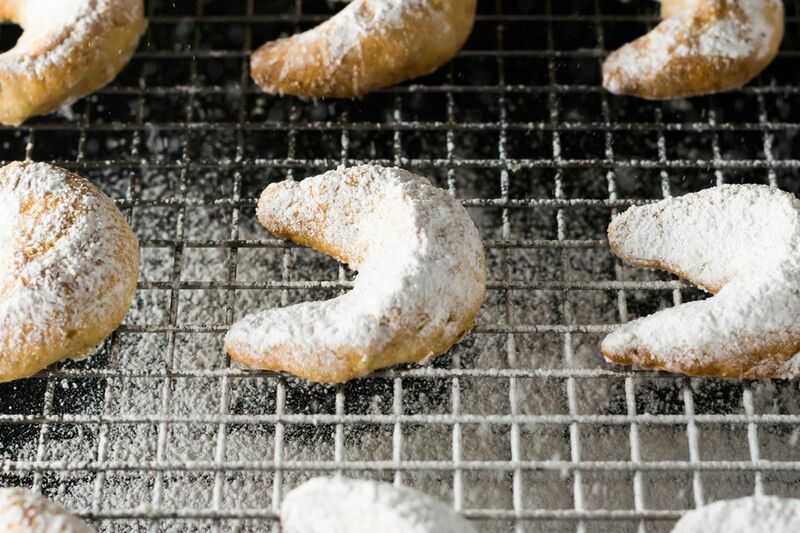 Some people like to roll these in vanilla sugar while they are still hot, and yet others prefer them rolled in confectioners' sugar—it looks like they've been dusted with freshly fallen snow, which is so perfect for Christmas. Heat oven to 325 F. In a large bowl, cream butter and add sugar, vanilla, and water and cream again. In a separate small bowl, whisk together all-purpose flour and salt and add to the creamed mixture, combining thoroughly. Add chopped nuts of choice and mix until completely incorporated. Form walnut-size pieces of dough into crescent shapes on parchment-lined baking sheets. Bake 15 to 20 minutes or until golden brown on the bottom. Allow cookies to cool 2 minutes on the baking sheet. And then, while still warm, roll in confectioners' sugar or vanilla sugar. When cookies are completely cool, again roll in confectioners' sugar or vanilla sugar. Transfer to an airtight container. They will keep several weeks. Every country that celebrates Christmas has special holiday recipes for savory items and sweets, especially cookies. Czechs really pull out all the stops when it comes to baking cookies and some only appear at Christmas, while others are year-round treats. If you have a favorite flavor memory, there's no reason to wait until the holidays to experience that taste year-round. Basic Christmas cookies: This basic Czech cookie is known as susenky and it can be formed into myriad shapes, some filled, so you'd never know it came from the same recipe. Butter cookies: Known as maslove pecivo in Czech, these cookies can be forced through a press or rolled into balls and indented to make thumbprints and then topped with a cherry or nuts. Black and white cookies: These are known as linecke testo dvoubarevne in Czech and are made with chocolate and vanilla doughs in various shapes—pinwheels, checkerboards, and more. Pirouette cookies: These Parisian cookies are called parizske pecivo in Czech. In the States, they are known as pirouettes made by tightly rolling cookies while still warm. Bears' paws cookies: In medvedi tlapicky, a cocoa-flavored dough is baked in French madeleine pans and the cooled cookie ends are dipped into melted chocolate and four almond "claws" are inserted into the paw. What Are Eastern Europe's Most Popular Cookie Recipes With Nuts?